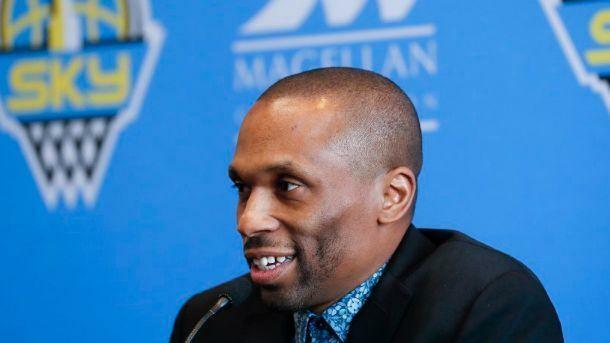 Days and weeks of speculation about who would be the next head coach of the Chicago Sky culminated in a press conference on Tuesday when the Sky introduced former Minnesota Lynx assistant James Wade as its new head coach. A quick look into @coachjameswade's first day with the Chicago Sky! What really stood out for us as we went through in talking to coaches, players, and the league is just how phenomenal he is with his relationships with players and helping to develop them and really bring the best out of them. Wade takes the helm of the Sky after Amber Stocks held Chicago’s coaching position for two seasons. 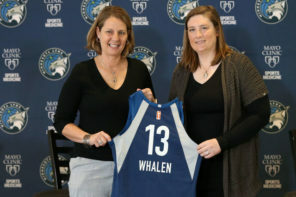 He joins the team on the heels of working with the Lynx as well as with UMMC Ekaterinburg, where the Sky’s Courtney Vandersloot is playing for during the WNBA offseason. Alter attended along with John Rogers and Diamond DeShields, who will be in her second season with the Sky attended the presser with Wade. I’m very grateful for the opportunity that you’ve allowed me to express my leadership. It’s something that – I won’t let you guys down and I’m looking forward to that championship too. Wade gave a shoutout to his parents who were in attendance for the Tuesday news conference as well as two coaches who he credits with helping him ascend to the WNBA’s head coaching ranks – Cheryl Reeve who is in Minnesota and Dan Hughes who is in Seattle. Reeve and Hughes, of course, coached the WNBA champions from the last two seasons, respectively. It’s been such an honor and a privilege to work under two championship coaches and two coaches that have allowed me to express myself and to grow. And it’s something that I don’t take for granted. Of course, he also mentioned that having the chance to coach top-tier talent has also made the process worthwhile. The players – and the league as well. From Minnesota to San Antonio, great players want to be coached and I’ve had the opportunity to coach some great players and I’ve had the opportunity to grow with those great players. When the floor was opened up for questions, he was asked about his coaching style. He said that while he will hold players accountable, he also understands the rigors of being a player in the WNBA. I understand what players go though. I understand what they need to get them going, what motivates them and I try to use that to the best of my ability. Great players want to be coached, but they also want to be guided in the right way. He later mentioned that part of guiding them is building a trust and rapport with players. Trust is a two-way street and Wade said he wanted to give a ‘safe haven’ for players to express themselves as he understands most players have played basketball for a while. With the last two seasons being less-than-stellar campaigns in Chicago, which included moving from Allstate Arena in Rosemont to Wintrust Arena in the South Loop, Wade believes that players will buy in to what he believes is the winning formula given his pedigree with the Lynx and working alongside Reeve and Hughes in previous coaching stints. [Players] love coaches with credibility because they don’t have to wonder and guess, ‘Does this guy know what he’s talking about?’ They know it right away. Wade is not only being hired as the team’s coach, but also its general manager. He says his approach to that job will entail a forward-thinking approach where it is about the Sky long-term as opposed to simply building for the short-term. He later was asked an interesting question about growing the Sky as a team and as a brand. 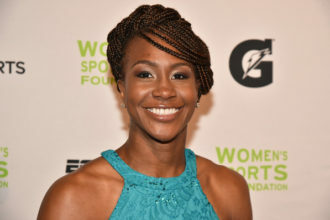 Wade claims that it is important for the Sky to further get their names out there and that they have a player who stakes a claim to being one of the signature faces of the W in Courtney Vandersloot. I think for the last two years, she’s been the best point guard in the league. She hasn’t been voted to an All-Star Game yet. 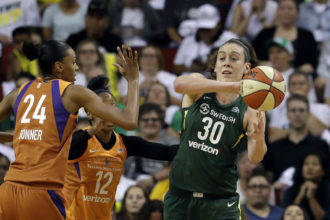 He also believes it should be a point of emphasis for the Sky to compare themselves to other championship teams and do what they did in order to ascend to the WNBA’s top class. Wade also believes having the right personnel is tantamount to creating a winning culture – in Chicago or elsewhere. From the discussions that I’ve had, I think…we have that here. The next thing is you have to have non-negotiables. So, it’s things that – you know – you don’t bend. He elaborated by mentioning that if one lets players know right off the bat what will and will not be acceptable, then improvement follows. Alter was then asked about the rebranding process. He mentioned how it is a tough process given being part of a women’s professional sports league and the lapse in attention it receives in comparison to men’s leagues. Another reason he gave is that Chicago is a city that is plentiful in sports teams. He said to continue to expect more from the Sky’s aggressive social media outreach in the offseason in terms of player content. He believes that those successes are beginning to happen – referencing the Sky had its best attendance in its history in the team’s first season at Wintrust Arena. Alter did say that community outreach in the offseason is a challenge for many players given the fact that most of them play overseas and that this past season was a challenge given that it was more condensed. We want to get the players out as much as we can because they’re just phenomenal people and the more interaction they have in the community, the better for the league because they make that connection. So, we do as much as we can without taking away from the basketball side and the fact that that is their number one priority. A question fielded by Rogers pertained to how vital it is for work to continue to be done within Chicago’s inner city in getting its youth to Sky games. According to Rogers, a great deal of work is being done already on this front. The players have been terrific with that – showing up wherever you can bring kids together from the inner city. I know we’ve actually just watched that consistently and the players come and spend several hours with the young people, sit down and talk to them about their lives and their careers and inspire the younger people. Rogers also believes that what has helped has been an increased effort on the part of sponsors in helping the Sky’s visibility in becoming a more integral element of the Chicago community. Most of the major sponsors believe that community connection is really, really important. So, it’s kind of nice to have the sponsors be aligned with the values and interests of the Sky and what we’re all about. Basketball-wise, Wade said that he wants to run an uptempo offense with talent such as DeShields as one of the focal points. I like quick offenses, but with that being said, the offense was pretty good. Eighty-three points a game last year and that’s with taking the ball out of bounds every time on defense. So if we can get stops and rebound out of those stops, I think you’ll see an improvement in our offense. All in all, he hopes that his players can live up to their full potential. I’m going to hold them accountable and try to make them the best players that they can be and a part of that is not putting limits on them because I don’t want them to put limits on themselves. 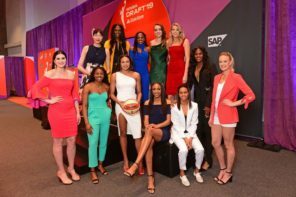 The Sky’s job being filled means the Dallas Wings remain the only team left who has yet to fill its coaching position full-time. Fred Williams was fired towards the end of last season after a dispute with Wings CEO Greg Bibb, which led to Taj McWilliams-Franklin being named the team’s interim head coach.